I’ve been amassing a pile of albums that I want to bring to Devon Record Club – old favourites, new crushes, canonical bugbears, sound-qua-sound obscurities – over recent weeks, and there’s now a stack of 20+ CDs on my shelves, enough to power through a whole year of meetings, unless we get theme-happy. Even then, I reckon I can probably gerrymander something from the pile in somehow. Paul’s Boutique was pretty much at the top of the pile. My favourite Beasties album (just eclipsing Check Your Head and then Ill Communication), I bought it when I was about 16 or 17, after a rash of bands I liked at the time (95/96) seemed to namecheck it an inordinate amount – Noel Gallagher, The Charlatans, The Chemical Brothers, reams of other pseudo-funky quasi-Britpop also-rans. I knew Fight For Your Right To Party, obviously, and was aware that Beastie Boys had a certain cache amongst very, very cool people, but by and large I didn’t really get why. After the obscene success of Licence To Ill, the Beasties ran away from NYC, scared of what they’d achieved and become at such a young age (lest we forget the go-go dancers in cages on stage), and holed up in LA with The Dust Brothers, DJs who’d been making sample-based, instrumental hip hop tracks which the trio had become fans of. The Dust Brothers thought the tracks they’d been making were too dense, too busy, too layered with crazy samples and juxtapositions to be rapped over, but the Beasties insisted that they didn’t want anything more minimal; they loved the sound collages, and wanted to weave themselves into them. 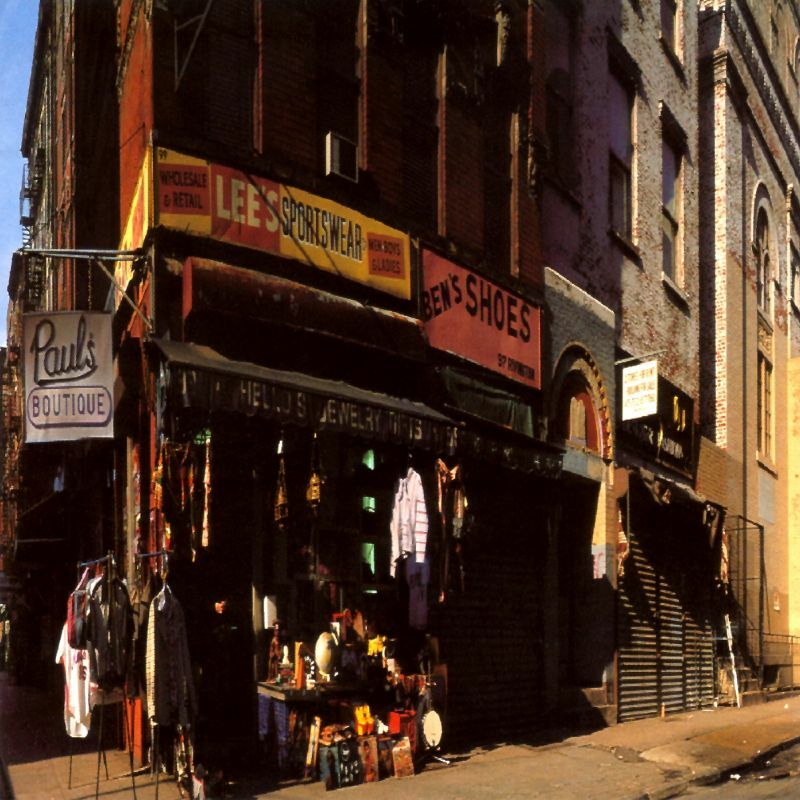 The result is an album which is essentially a love song to the Beasties’ estranged home city of NYC, from the sleeve to the samples to the innumerable lyrical references to the places and people and pop culture they’d grown up with. The rich, heavy, sample-woven music, which the Beasties’ voices are intricately intertwined with, is a pretty psychedelic experience, like a beat-heavy, hip hop, spot-the-reference recreation of the second side of Abbey Road, mixing hugely familiar moments of music (from Johnny Cash to Curtis Mayfield to The Isley Brothers to The Beatles to Sly And The family Stone to so much else) with the sounds of every day city life, ping pong matches, drive-by robberies, skits about eggs, stories about New Yorkers. It’s the opposite of Tom’s choice; so dense that half a lifetime later on I’m still catching new lyrical references, googling names I don’t know, recognising samples from old music I’m newly familiar with since the last time I played it. There isn’t much out there like Paul’s Boutique – Endtroducing and Since I Left You use samples in a similar way, but do something different in spirit; for the Beastie Boys, the samples and lyrics perform the same bewildering function. Changes to copyright law regarding sampling mean that no one can ever make an album like this again; but the sheer quality of the record makes it unlikely that anyone would be abloe to, anyway. In short, Paul’s Boutique is a trip, it’s got a funky beat, and I can bug out to it. Perfect. Tom Listened: For me, at some point during the 90s The Beastie Boys went from being an annoyance to a possibility to a treasure. I can’t quite remember the chain of events but, as usual, I think the catalyst in my change of mindset must have been the overwhelming acclaim that Check Your Head and (belatedly) Paul’s Boutique were getting from the press and from fellow artists. So I decided to buy my brother Check Your Head for his birthday. Curious to hear an album but not enough to get it for yourself…buy it for someone else’s birthday and then ‘borrow’ it, for a long, long time. Well, I loved Check Your Head and it is still my favourite Beastie Boys album. Listening to Paul’s Boutique at record club made me realise just how much more accessible it is. The songs on Check Your Head are more straightforward – there are fewer unexpected twists and turns and it’s less packed in with everything and the kitchen sink. I’m not saying CYH is the better album but I know it much better (although I have had PB in my collection for probably a dozen years I have never felt I really know it) and that certainly helps. With this in mind, it was great to hear Paul’s Boutique the other night and I will certainly be pulling it out aplenty in the forthcoming months and attempting to unpick its bizarre tapestry of sound. Rob listened: My brother handled hip-hop in our house. ‘Licensed to Ill’ was pretty important for him and I have fond memories of rotating it with ‘Yo! Bum Rush The Show’ and ‘Album’ by Public Image Limited whilst we played darts in his room. By the time ‘Paul’s Boutique’ came out we’d both moved on. It’s worth recalling that it arrived to no real fanfare, to general bafflement in fact. My sense is that it was only with ‘Check Your Head’ that commentators began to recognise the trajectory the Beastie Boys were on and the give them the credit they deserved as innovators and creative spirits. Still, I didn’t come back to them until ‘Ill Communication’. I’d never heard ‘Paul’s Boutique’ until this evening because, if i’m honest, whilst I admire what they do, I never find myself reaching for them. I don’t know why. I do find that the constant yapping voices create a wall of interference between me and the often compelling music. I guess I also find them a little too hipster. I dunno. Feel srtangely guilty even writing this. I’m extremely glad that the Beastie Boys exist. I enjoyed hearing the album and totally understand why it belongs in the canon. But once again, I can’t imagine i’ll invest much time in it. I might go back and listen to ‘She’s On It’ again though. Graham listened: I’m old enough to vaguely recall jumping about in nightclubs to the singles from the first Beastie’s album. But to badly quote Public Enemy, “I didn’t believe the hype”, which put me off the band for many years. I’ve heard this before and it didn’t fit with what I expected then, but listening again this is so deep and multi-layered that it simply demands I spend more time with it. If I finally get this one, who knows where it might lead?